Register: Run Your Business Live with SAP Leonardo IoT Bridge on August 17th. With 1,600+ members, SAP Leonardo customers, partners, and experts are part of an exclusive international community supporting your SAP Leonardo implementations and adoption initiatives. This community, known as the SAP Leonardo International Focus Group (iFG), gives you and your team access to face-to-face activities as well as webinars to help you deliver SAP Leonardo solutions to your organization. At the Leonardo Live conference, SAP announced SAP Leonardo IoT Bridge, a configurable role-based digital command center giving operations managers unprecedented visibility and ability to act in real time. 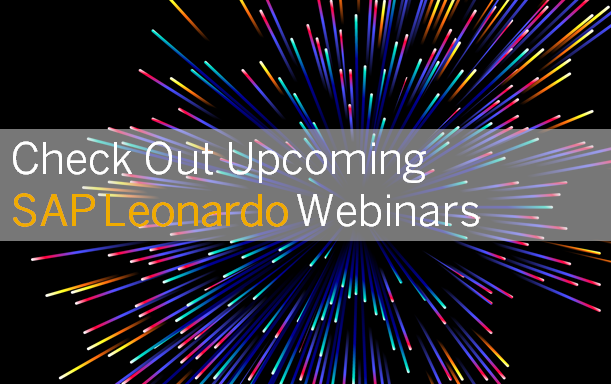 As part of the release and based on overwhelming customer and partner interest, the SAP Leonardo iFG Community will be hosting a series of webinars introducing the product. Download the Meeting Invitation to your calendars, and join us! For over 40 years, SAP has helped businesses run better through world-class software solutions that solve complex problems to help invent, commercialize, and mainstream the products and services of the global economy. Most recently, the rise of machine learning, artificial intelligence and finally the Internet of Things with its vast network of devices connected to the Internet, including smart phones and tablets and almost anything with a sensor on it – cars, machines in production plants, jet engines, oil drills, wearable devices, and more – has become a major driver of innovation across all industries. Adaptable cloud solutions that combine real-time information from connected things with business processes of the digital core. Intelligent and actionable data as well as the possibility to get from insight to action within a unified environment. SAP Leonardo IoT Bridge addresses these customer needs by providing a configurable cloud solution which offers a persona-centric work environment that enables integrated real-time contextual visibility across IoT and business process data from SAP and 3rd party systems. This solution enables operational roles, along with real time decision support and analytics so that operational users can react to and prevent unplanned events in day-to-day operations. Join the SAP Leonardo International Focus Group Community!